Conflict prevention is key. Some of the key speakers were Special Operations Commander of SOCOM, US Senator and Cory Booker, the Secretary General for the US Department of Homeland Security, Jeh Johnson and an introduction presented by UN Secretary General, Ban Ki Moon. All emphasised the need to increase violence prevention measures and capacities of vulnerable communities to address VE. CVE is largely undefined, misunderstood and underfunded. “Resources are the fundamental expression of priorities.” Conflict prevention has been advocated in the VE arena for some time, but only recently has it gained funding traction in the US. Still, compared to Counter Terrorism, CVE is a tiny drop in the bucket of the billions spent per year on the military and intelligence sectors. CVE also suffers from the growing pains of a burgeoning and newly funded field. Lastly, there was little discussion on overarching definitions of VE, or even CVE. Recognition was given to the difficulties in defining both, but that all programmes should operate around what VE/CVE mean at the micro-level. Working in and on the local context was the most prominent point of the conference. “Trust is the strategic and operational capital for CVE programmes.” Understanding the micro, or community-level, environments is the only way CVE is effective. Literally every speaker and discussion mentioned that the local perception of the push factors and, importantly, the “how” of the pull factors, is unique to every area and vulnerable population. Thus, CVE programmes must be community-led, targeted and intentional. Well-thought-out framing of CVE programmes is key to local and international acceptance. “Never use CVE to frame a programme.” “All CVE efforts should be integrated into other community-led programmes.” I completely agree with the first quote, as labelling a programme CVE increases the risk to the community and CVE practitioners. Framing a programme as CVE also has many unintended negative connotations linked to militarisation, oppression and even neo-colonialism that limit community, government, NGO and international cooperation. It is important to bring in broader development and humanitarian coalitions and a CVE label will instantly isolate the programme. CVE programmes must be agile. The flexibility and adaptability of CVE programmes was consistently and boldly emphasised. In VE and fragile contexts, change is the norm. CVE programmes will always be operating with a deficit of information. Thus, programmes must have systems for local contextual analysis and organisational learning that consistently integrate new understanding and contextual changes. Difficulty of M&E in CVE. Obtaining specific metrics for local-level context and conflict prevention is essential for success and future funding of CVE. However, everyone recognised that utilising tangible and quantifiable indicators expressing “prevention” was often (but not always) difficult to achieve. Avenues to explore, and that donors seemed amenable to, were “plausible correlations” of precursors to violence and the USAID Learning Lab indicator free M&E approaches, such as outcome harvesting and most significant change. Investigate geographic-focused pull factor systems. Use real-time operational research to identify gaps between project designs and outcomes and inform a learning-by-doing approach. Focus on listening and learning over solutions to problems. The goal of CVE projects should not be to meet predetermined benchmarks, but to learn which elements of one’s initial understanding of the system were right and which were wrong. Use systems thinking and visualisation to demonstrate the multiple and parallel entry/focal points for interventions in a targeted community. Use a continually evolving portfolio of interventions. Answer the questions: 1) How do we gather data to represent the complex environment? ; 2) How do we programme better in a complex environment? ; 3) How are we going to get quick wins using complex theory? Use mixed methodologies/theories besides and with complex systems. Linear or “problem then solution” Theories of Change (ToCs) are difficult to utilise in the complex and ever-changing VE environments. Thus, the following concepts enhance the effectiveness of ToCs in the CVE arena. The ToC needs to be presented as an overarching framework that explains how the programme intends to work, but without detailing the specific mechanisms of change (i.e. interventions). The first version of ToC should still be fairly general since we cannot yet know much about the intricacies of how change happens. It essentially is the representation of our knowledge and hypotheses we start off with. There should be a ToC that is specifically centered on the flexibility, adaptability and learning of CVE programmes. Use technology to capture local and national context, sentiment and narratives. “What’s in people’s minds becomes actions.” The importance of social media analysis as a component to any CVE programme cannot be understated. The tech analysts expressed over and over that there are so many inexpensive and open-source (free) software programmes that are under-utilised. E.g. Agolo: Summarises large amounts of text in seconds, plug in news sources and subjects and it creates daily/weekly news letters, performs social media analysis. http://www.agolo.com This is one that I have already started the process for. Symantica Pro: network and link analysis, quite complicated. Recorded Future: Sentiment and social media analysis. Open Situation Room Exchange: hashtags that are driving in social media. ICCM Project: collects multiple sources and identifies overlaps. Our world is insufficiently prepared for an increasingly complex risk environment. This stirring call to arms was recently issued by the World Economic Forum in its Global Risks Report. The Forum’s study of the planet’s most pressing problems reveals that the underlying nature of the risk is changing. The pace of political, economic, social, environmental and technological change is unprecedented. As never before, we are faced with risks that are increasingly complex, unpredictable and volatile. The rising dangers of climate change, environmental degradation and resource scarcity. 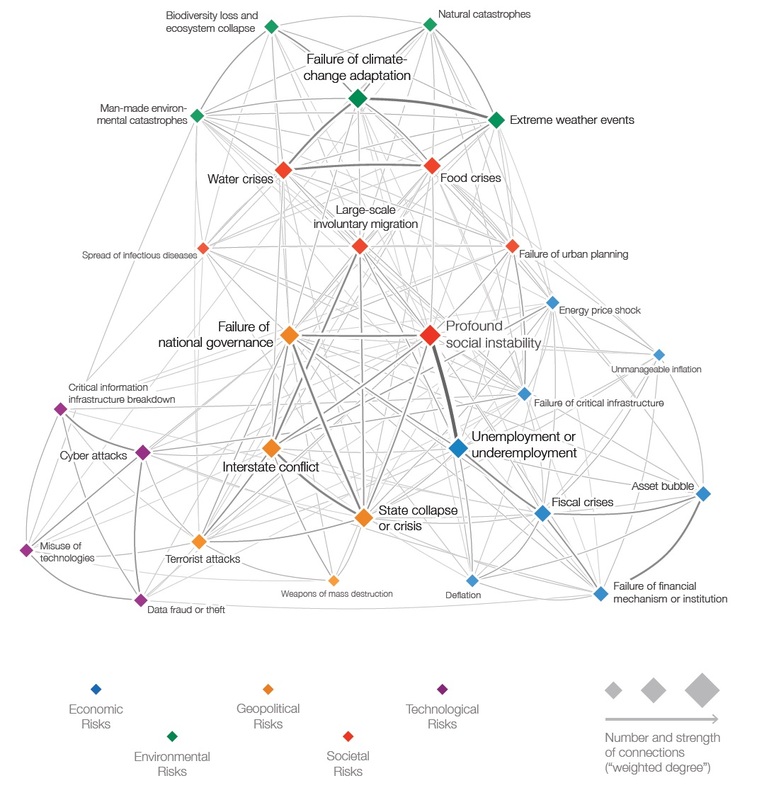 Yet it is when the interconnections between these risks are mapped, that we begin to understand just how complex an environment we face. In Africa, this landscape is posing extraordinary challenges for decision makers at all levels. The risks of climate and economic shocks, the fear of instability and extremism are rising. How do we prepare for and build resilience against such risks? How do we mitigate the consequences? How do we avoid collateral damage and the unintended fallout? Complex risks transcend borders, politics and spheres of influence. And they require complex solutions. Conventional thinking won’t work. New approaches are required, new collaborations across countries and industries, which forge new partnerships to think and act differently. The nature of war is changing. Two years ago, the State Council declared that global conflict was becoming “more integrated, complex and volatile”. Their view would appear prophetic given the recent spate of hostilities in countries such as Libya, Ukraine, Palestine and Syria, all fuelled by highly combustible combinations of social, political, geographic and resource-based triggers for violent competition. Against this alarming trend, we also see a proliferation of the responses devised to counter what is perceived to be a growing threat to national interests. Such reactions are driven by an increasingly disparate assortment of political, economic and security agendas, backed by an dazzlingly diverse array of actors, from emerging economies seeking to flex their international muscle to enterprising private companies exploiting frontier markets. As a result, we find ourselves witnessing the birth of whole new industries, sparking an explosion of the acronyms used to describe increasingly complex “solutions” to counter increasingly complex threats; Countering Violent Extremism (CVE), Serious & Organised Crime (SOCA), Security Sector Reform (SSR), Counter-Terrorism (CT) and Counter-Insurgency (COIN). All these and more, crowding the spaces traditionally reserved for more “conventional” military, development and humanitarian interventions. Among such approaches now at the disposal of foreign governments is “Stabilisation”, a poorly understood and often contentious term that has been used to define western responses to a multitude of crises over the past decade. But fundamental questions have emerged to challenge the orthodoxy; what is it exactly? Is it relevant or even effective? And what of its future? Such questions were the subject of a recent international conference hosted by the Danish and UK governments. “Stabilisation” as a mandate first formally emerged with the appointment of the Stabilisation Force for Bosnia and Hezogovnia (SFOR) in the early nineties. It has since been practiced most explicitly in military-led campaigns in Iraq and Afghanistan, becoming firmly wrapped up in the hubris of the US-driven War on Terror. Over that time the concept has increasingly become muddied in the waters of counter-insurgency operations, consent winning military activities, counter-terrorism initiatives and wider state building ventures. Often it has been derided as a callow attempt to ‘win hearts and minds’, an approach reduced merely to the delivery of notoriously expensive and often counter-productive ‘quick-impact projects’. Its usefulness in tackling conflict has been further undermined by institutions – military and civilian alike – adopting a confusing patchwork of interpretations to suit their own purposes, and badging increasingly varied, even contradictory, activities under the moniker of stabilisation. Conduct a quick survey (as we did of our international partners in Somalia) and you will immediately encounter the ugly truth; “Its too difficult, we shouldn’t bother.” “Its everything, and its nothing.” “It’s had its time”. Yet whether we like it or not, stabilisation appears set to stay. Since the mid-1990s, twenty-nine multi-lateral UN, NATO and EU missions have worked to peacekeeping, peace enforcement or political mandates which include the promotion of stability. These include the Central African Republic, Liberia, Mali, South Sudan and Kosovo. A further sixteen multi-lateral missions have been explicitly mandated to use stabilisation to achieve their strategic objectives in countries such as Afghanistan, DR Congo, Somalia and Haiti. Together, these efforts have involved budgets in the billions, tens of thousands of troops, and the engagement of many western government’s political and development ministries. In short, stabilisation matters. Learning the lessons and getting it right in the face of today’s rapidly mutating threats to global stability is more crucial than ever. Hence the conference; a gathering of policy makers and practitioners from the Danish, UK, US, Canadian and Dutch government agencies charged with overseeing stabilisation efforts abroad. With the dust still settling on a two-year stint as Senior Stabilisation Adviser for the British Embassy in Somalia, I was roped in to help facilitate the gathering. The event, held in the grounds of Wilton Park in East Sussex, primarily served as an opportunity for the UK and Danish governments to unveil their newly varnished stabilisation doctrine. The UK, following an exhaustive cross-governmental consultation, has refocused its definition of stabilisation around an explicitly political aim; as “one of the approaches used in situations of violent conflict designed to protect and promote legitimate political authority, using a combination of integrated civilian and military actions to reduce violence, re-establish security and prepare for longer-term recovery.” Whilst the tighter political focus was generally welcomed, concerns were raised over how legitimate political authority should be determined and promoted. The Danish have taken a broader view in their newly published Integrated Plan for Stabilisation Engagement. In their glossy brochure-style treatise, they propose a multi-dimensional, multi-agency approach to tackling threats to stability “lying at the nexus of security and development in fragile states” such as extreme poverty, religious extremism, economic crime, refugee flows and terrorism. Whilst the expansive approach succeeds in bolstering pan-government agendas, it risks reinforcing the notion of stabilisation as yet more empty foreign policy jargon. Yet the similarities of the two approaches are more striking than their differences. Both governments recognise that the stabilisation of fragile and conflict affected states is a risky but essential challenge for the 21st century. Both see it no longer a question of whether to engage in stabilisa­tion, but of where and how to engage in the future. Both see stabilisation as central to forging greater unity across overseas developmental, diplomatic and defense contributions. However, and despite the rhetoric, the real test lies in moving beyond past failings, of heeding the lessons which were all too painfully laid bare during the conference. Few attending had emerged unscarred by previous mistakes in undertaking stabilisation in far-flung war-torn corners of the globe. However with the growing mess of threats to security arising from countries as diverse as Iraq, South Sudan, and Nigeria, it is clear that the demand for stabilisation is only likely to grow. Smarter definitions, a growing library of lessons learned and more relevant concepts hewn from experience are a good start. Yet the real worth of the exercise will be the extent to which policies are improved and delivery on the ground is sharpened. My own recent experience of establishing a two-year $18million programme designed to sustain military and political gains in the battle-scarred southern reaches of Somalia offered rich insight into the realities and shortcomings of what could be achieved through a targeted initiative overseen by a dedicated team of specialists with the freedom to innovate, move quickly and build on success. A number of forthcoming events however will serve as the real litmus test of positive change; NATO’s strategic rethink, the UK’s Strategic Defense Review, as well as the achievements of the UK’s new Conflict, Security and Stability Fund and the Danish Peace and Stabilisation Fund. Only then, if and when we see future stabilisation undertakings moving beyond a decidedly mixed track record to an approach driving demonstrable results on the ground will we be reassured that the effort, and the cost, has been worth it. Hamish recently concluded two years as the British Government’s Senior Stabilisation Adviser in Somalia, and now lead’s Wasafiri’s conflict and stability practice – dedicated to working with military, political and civilian organisations to help deliver change in fragile and conflict affected regions. Hamish Wilson https://www.wasafirihub.com/wp-content/uploads/2018/08/Wasafiri-LOGO-1.png Hamish Wilson2014-11-24 17:57:502014-11-24 17:57:50What does 'stabilisation' actually mean?